Isolde Olvera Santana was born in Mexico City. She discovered her love for the guitar at the age of six, playing and singing popular music. 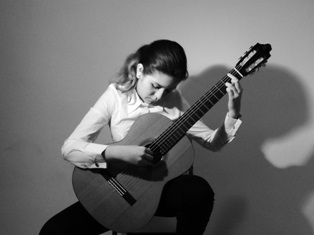 At the age of eleven she began studying the classical guitar with Marion Langer at the Music school Margareten in Vienna, Austria (Musikschule Wien). In 2015 she appeared on the Mexican television, playing solo and accompanying her mother mezzo-soprano Eva Maria Santana. She gave her first solo recital in March 2016 at the Embassy of Mexico in Austria. in 2016, after being the winner of her age category in February, she won the Austrian national music competition Prima La Musica in May with 25/25 points. In June 2016 she took part in the Prima la Musica winners concert at the Brucknerhaus Linz, one of the most important concert halls in Austria. You can listen to Isolde on her YouTube channel. If you are interested in working with Isolde, please get in touch with the EMCY Office.